The biodynamic Basil & Garlic cheese from Demeter is particularly tasty thanks to the added herbs. This is a very creamy cheese that gets a slightly spicy character due to the addition of basil and garlic. Very tasty on a cheese board, to add to a salad or for in a sandwich. Because this cheese is produced using vegetarian rennet, it is perfectly safe to be eaten by vegetarians. Furthermore, this Demeter cheese is free of lupine, sesame, mustard, soy, egg, celery, sulphite, wheat, gluten, peanuts and nuts. The cheese is cut to order according to your wishes and vacuum packed. 3. Starter < 0,8 micro-biol. 5. Vegetarian rennet < 0,03 micro-biol. The cheese is made with biodynamic milk from farmers who work according to Demeter's standards where animal welfare and the natural cycle are key. The young Gouda Organic biodynamic cheese from Weerribben Zuivel is manufactured without the use of genetically modified organisms. 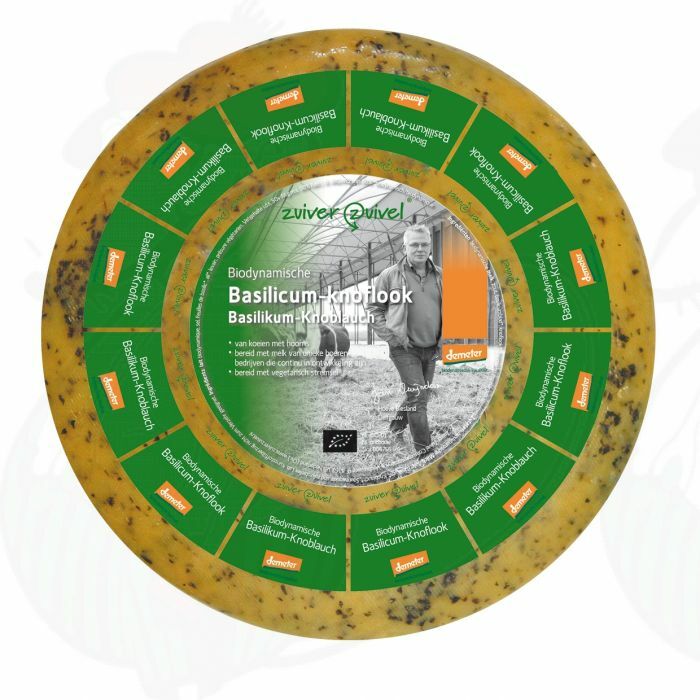 The cheese complies with current European legislation, including with regard to chemical contaminants and residue levels. This cheese is free of artificial colours, natamycin and nitrates.